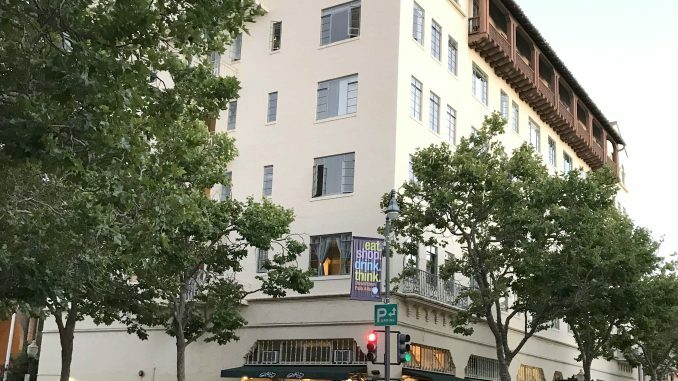 Four Palo Alto city laws are standing in the way of the Hotel President apartments from being converted back into a hotel, and the City Council is set to consider changing one of them on Monday (Dec. 10) night. The company told the residents of the building’s $2,000-a-month studio and one-bedroom apartments that they would be evicted last month. On Monday, the council is set to discuss changing the city code section on grandfathered uses and facilities downtown, which currently prevents property owners from converting the use of an oversized building. That means buildings like the Hotel President, which are too large to get past the city review process today, have to continue being used in the same way they are now. Changing the code would mean the President could be converted from residential use to commercial. Critics have raised a number of concerns about the project, including the loss of 75 apartments during a housing crisis. Some suspect that the city is rolling out the red carpet to allow AJ Capital to make the change. Is city rushing the change? Jeff Levinsky, the Palo Alto Neighborhoods activist who brought city planners’ attention to the prohibition days before the sale went through, has raised the concern that the city is rushing the change to the grandfathered facilities law without first bringing it to the Planning and Transportation Commission. Interim Planning Director Jonathan Lait said the amendment doesn’t need to go through the Planning and Transportation Commission because it’s a correction to a past typo. “There’s no policy analysis that’s really involved in this at this point. We’re going back to the City Council to give them an opportunity to restore it back to the pre-2016 standard, or if they want to make any changes to it, they can direct those changes,” Lait said. If the council wants to make any changes to the rule on Monday, they can send it back and it will go through the Planning and Transportation Commission, Lait said. The other three laws are the downtown grandfathered use law. That ordinance is similar to the downtown grandfathered facility law and prevents AJ Capital from changing the use of an overly dense building. The Hotel President has a floor-area ratio — the number of square feet of development built per square-foot size of the lot — of about 5.0. Only floor-area ratios of 1.0 are allowed downtown, and hotels can only have a maximum of 2.0. The council will also consider removing the downtown commercial cap of 350,000 square feet next year. The council voted 5-4 to remove the cap in January, while the Planning and Transportation Commission voted to keep it in July. The fourth law preventing the conversion is the downtown commercial parking requirement. One option for AJ Capital to comply with the parking requirement would be to buy in-lieu parking spaces off the site for about $70,000 each. City Manager Jim Keene, Mayor Liz Kniss and Vice Mayor Eric Filseth did not return requests for comment.